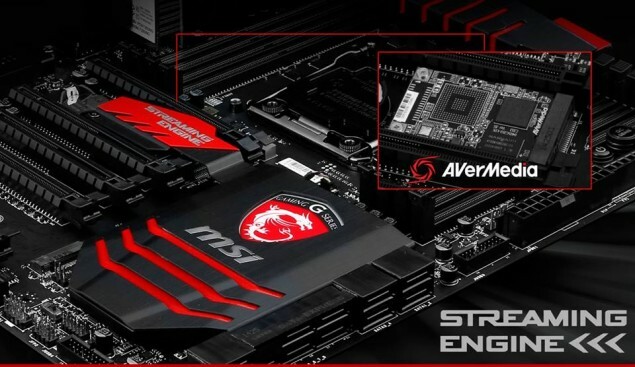 MSI has such a high-end and incredible X99 motherboard lineup planned for launch later this month, its getting literally crazy every time I see their monstrous boards for the beastly Haswell-E platform. 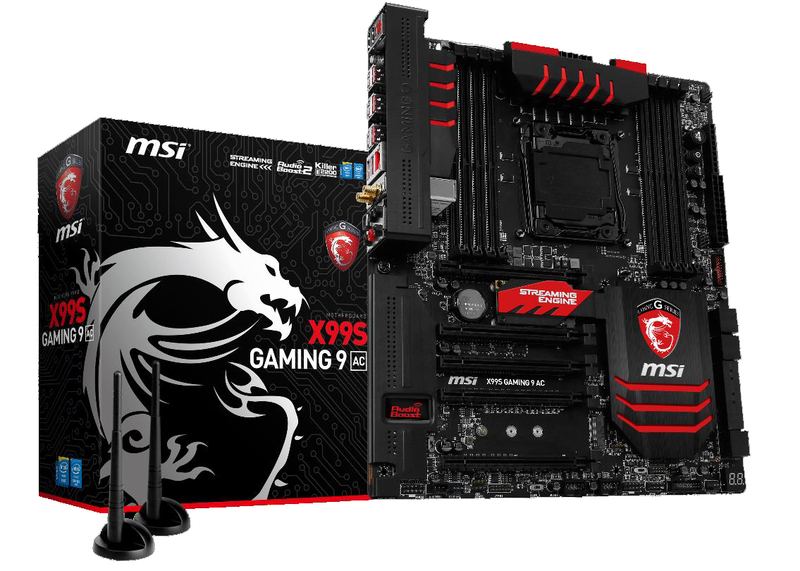 The X99 Motherboard lineup officially launches on 29th August along with the Haswell-E processors as reported previously and MSI has five motherboards ready for action for overclockers, enthusiasts and gamers. Note – (Images are courtesy of PC-Watch). The article was officially published in a public release by PC-Watch which can be seen in the link provided – http://pc.watch.impress.co.jp/docs/news/20140822_663093.html. 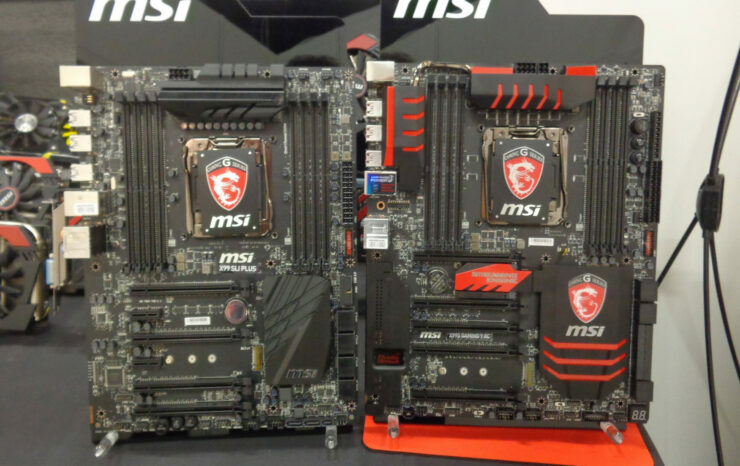 The article states that the information has been made public and published by MSI on their X99 lineup. The MSI X99S XPOWER AC is featured in MSI’s overclocking lineup and is as high-end as it gets in MSI’s X99 lineup. 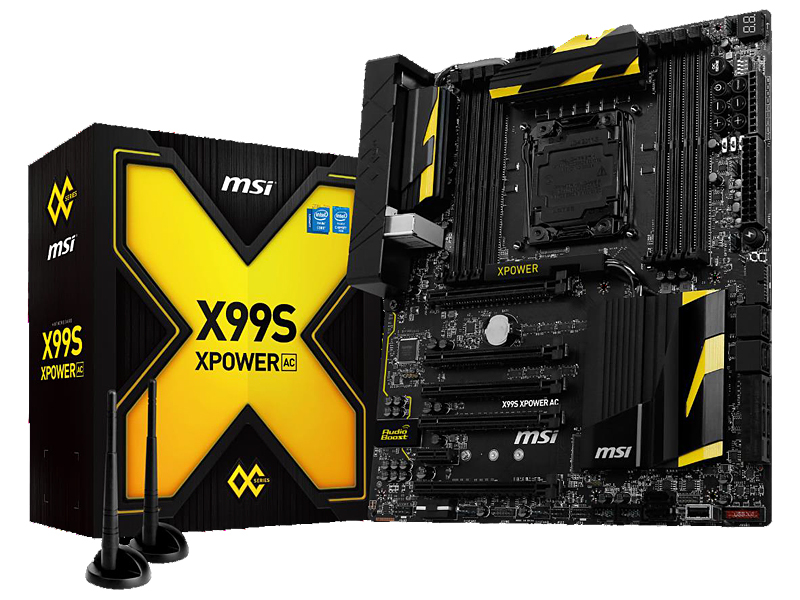 The MSI X99S XPOWER AC is aimed at overclockers and enthusiasts who demand nothing less than the best. 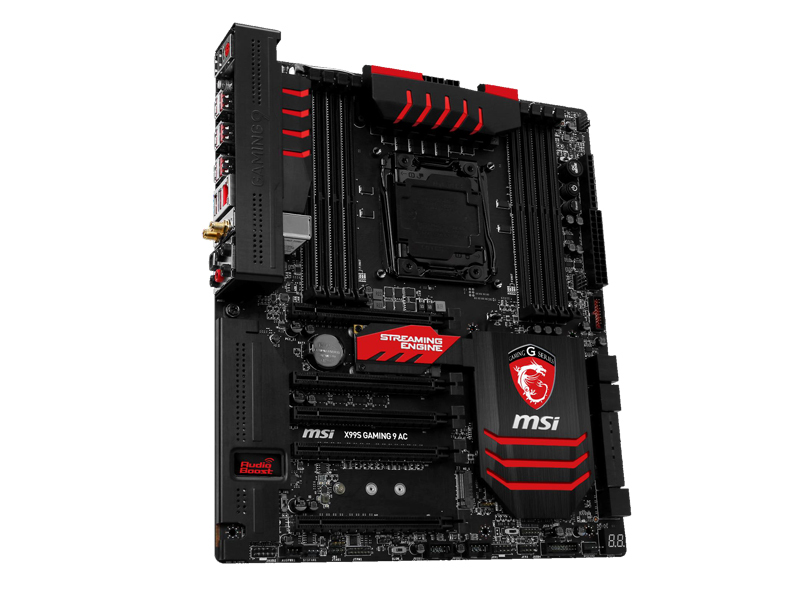 The motherboard has a beefy design and comes in the E-ATX form factor, something which the past XPOWER series motherboards have followed and its great to see MSI keeping the traditional alive and updated. 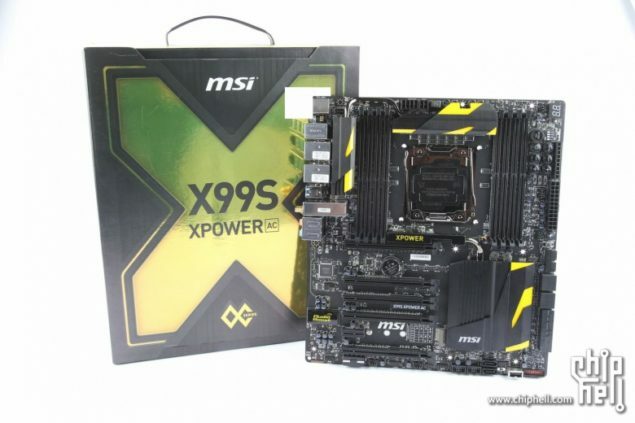 The MSI X99S XPOWER AC features the traditional yellow and black color scheme of the XPOWER motherboards. 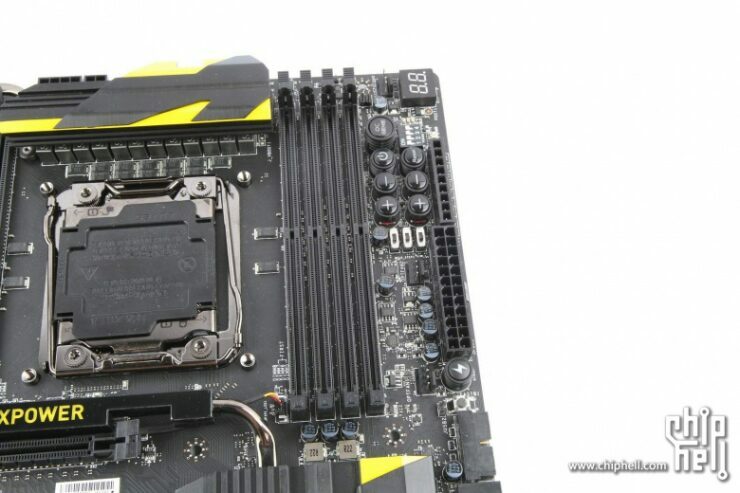 The board packs the LGA 2011-3 socket that is powered by dual 8-Pin connectors. Considering the X79 Big Band XPOWER II came with a 22 Phase PWM given the space restriction on these boards, the X99S XPOWER AC can feature a 24 or 12 Phase DIGITALL Power VRM, providing unparalleled amount of overclocking performance and stability to the motherboard featuring an 8-Layer PCB design, Military Class IV components with solid state capacitors, Hi-C Caps, Super Ferrite Choke while the DARK Cap on the other hand features a core design made of aluminum with a lower ESR and a life space of 10 years. 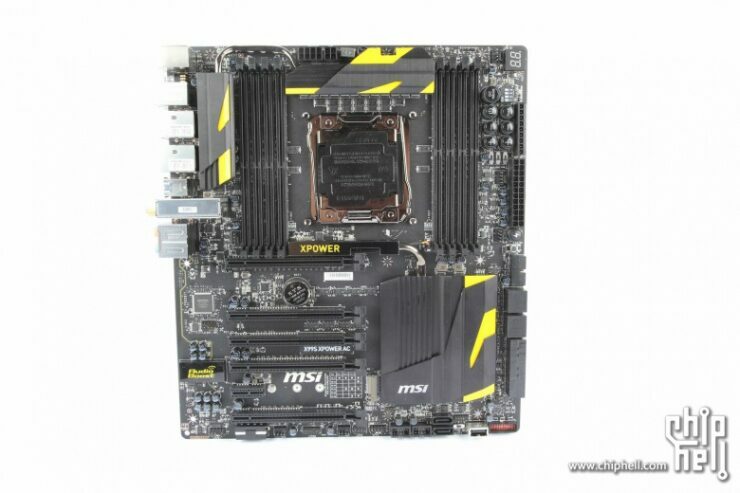 MSI’s boards also use the Super Ferrite Chokes which run 35 degrees cooler, have 30% higher current capacity with 20% improvement in power efficiency and offering stability. The CPU socket is surrounded by four DDR4 DIMM slots (four on each side) which will be able to support overclocked memory beyond 3000 MHz. The first generation of DDR4 memory will feature traditional speeds of 2400 – 3000 MHz at 1.2V and 1.35V memory when reaching 3200 MHz and beyond but as the memory design matures, we will be looking at faster DIMMs with speeds beyond 4 GHz frequency. Expansion slots include five PCI-e 3.0 x 16 slots with ample spacing in between them to support 4-Way SLI and CrossFire graphics cards. There’s also a single PCI-e 3.0 x1 slots and a mSATA Connector to support the latest NGFF solid state drives. A 4-Pin PEG connector is place at the bottom of the board to supply additional power to the PCI-Express lanes when using multiple cards. Right next to the DDR4 DIMMs, we can spot several overclock swtiches which include OC Genie, Power On/Off, Voltage Adjustments, BCLK Increase/Lower buttons (OC Engine; adjustments of 100 MHz/125 MHz/ 167 MHz BCLK) and V-Check panel to measure voltages during overclocking sessions. A diagnostic LED is fitted on the top right corner. Storage includes 10 SATA 6GBps connectors include two SATA Express ports while there’s also a right angled USB 3.0 header and two USB 2.0 headers and an additional USB 3.0 port near the bottom side of the motherboard. The cooling design is off the charts with four sets of heatsinks which feature heatpipe interconnected through each set transferring heat for better load dissipation. The middle heatsink has the XPOWER logo while the PCH heatsink is large enough for the X99 chipset so its may be housing other components beneath it. We can’t be so sure as to what these components might be. The strikes of yellow color on the motherboard along with the XPOWER lit up since they feature a small LED beneath them to give a nice effect. 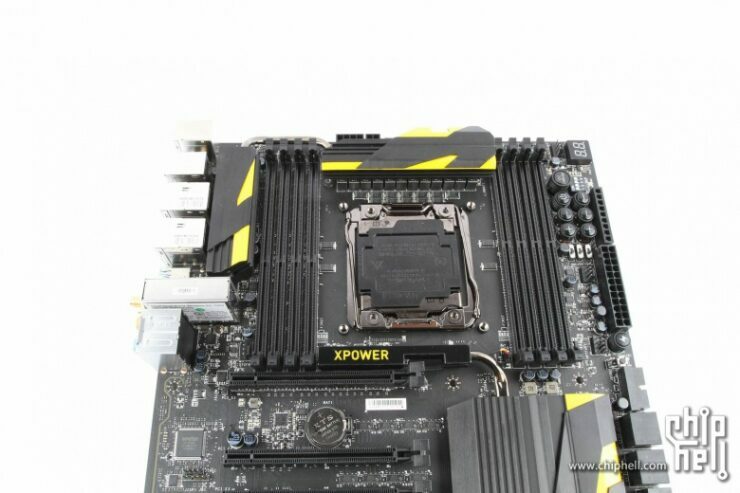 We have already seen this on the Z87 XPOWER and MSI is following the same with the X99S XPOWER AC motherboard. The board features the Audio Boost 2.0 technology featuring an ALC 1150 codec which is isolated on a separate PCB. Being a AC board, the MSI X99S XPOWER AC features 10 USB 3.0 ports, 2 USB 2.0 ports, PS/2 port, Gigabit Ethernet port and a IEEE 802.11 ac-enabled wireless lan module with Bluetooth 4.0 wireless connectivity. 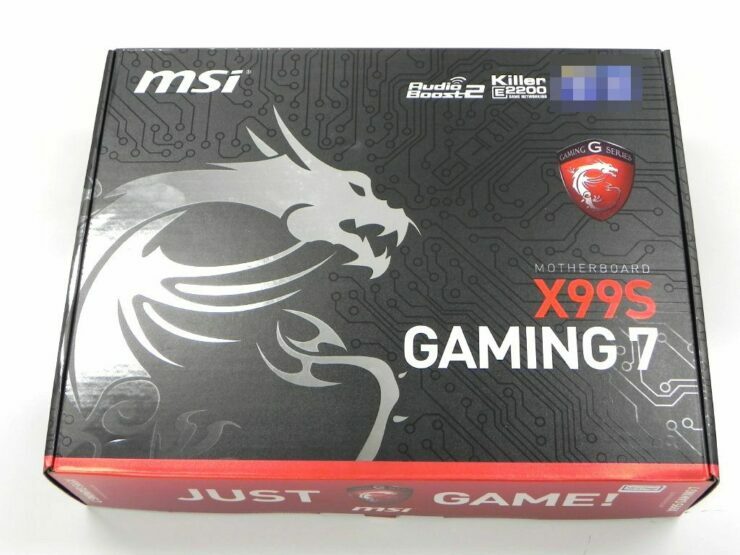 The MSI X99S Gaming 9 AC sticks with the red and black color scheme which MSI has implemented in their Gaming series brand along with several other manufacturers who are using the same scheme. The motherboard has three sets of heatsinks, two along side the VRM, PWM and one on the PCH. The LGA 2011-3 socket is compatible with Intel’s upcoming Haswell-E processors which will be available in retail by this month’s end if reports are true or we will see them in the first week of September. 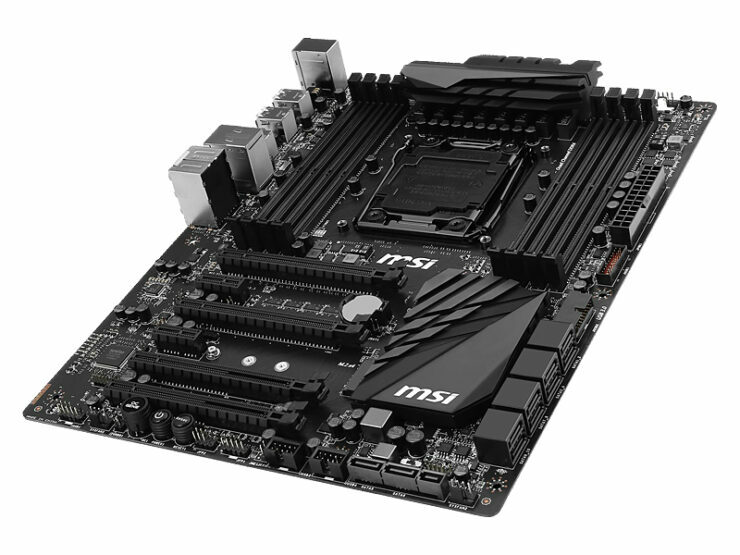 The board features an 8 Phase PWM supply fitted with MSI’s Military Class IV components and powered by a 8+4 Pin power configuration. The LGA 2011-3 socket is coupled by eight DDR4 DIMM slots, four on each sides which can support overclocked DDR4 memory sticks on-the-go. Since MSI has featured their Military Class IV components, they also use the OC Engine, Power On/Off and Reset switches which come in handy when overclocking this beast of a board. The X99 Express Chipset is seated beneath a large Gaming G-Series heatsink. The heatsink itself resembles a shield with a second shield engraved as a logo in the middle. Expansion slots include five PCI-Express 3.0 x16 slots which storage includes 10 SATA 6 GB/s and two SATA Express ports. A small diagnostic LED is located at the bottom right hand corner of the board. Now the most interesting feature about this motherboard is that it houses a streaming engine which featured an AVerMedia chipset to allow 1080P live streaming at 60Mbps bitrate which is quite impressive considering it will take the load off the GPU and ensure you get the fastest performance out of your hardware. 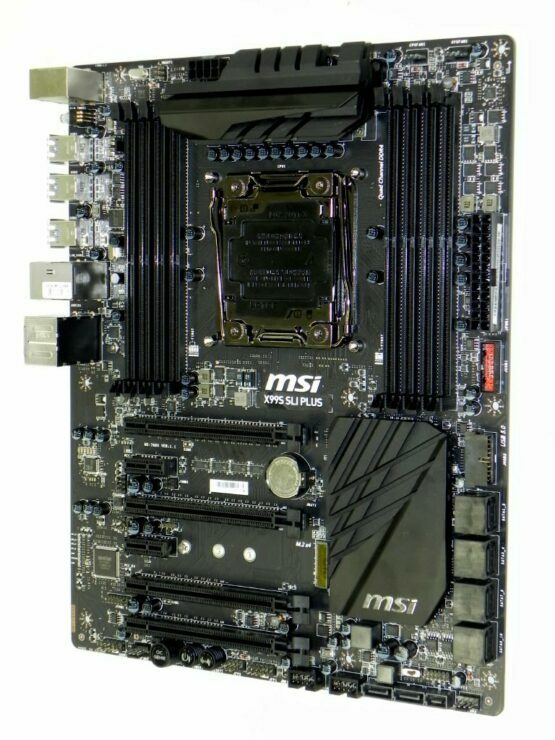 Since this is a gaming tier board, MSI will not compromise on additional features and include their Audio Boost ALC 1150 powered chipset and Killer E2200 LAN chip for better audio and networking while a large thermal armor will run across the I/O and audio isolated PCB section for better thermals. 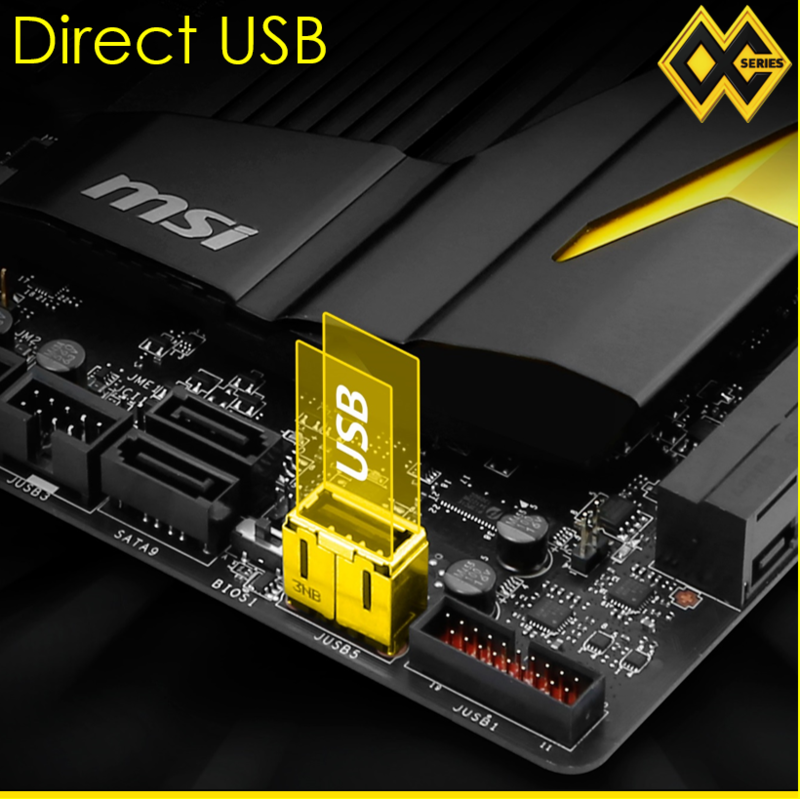 In addition to the PCI-E ports, MSI has also added an mSATA SSD slot at the top of the bottom most PCI-e slot for NGFF SSDs. MSI also teased the I/O of the board a while ago featuring a full matte black cover with red I/O ports that include the PS/2 port, 8 Super Speed USB 3.0 ports, 2 USB 2.0 ports, LAN port, 802.11 B/G/N/ AC antenna connectors and a 7.1 Channel audio jack. A USB 3.0 header is also located near the SATA ports for front USB panel. 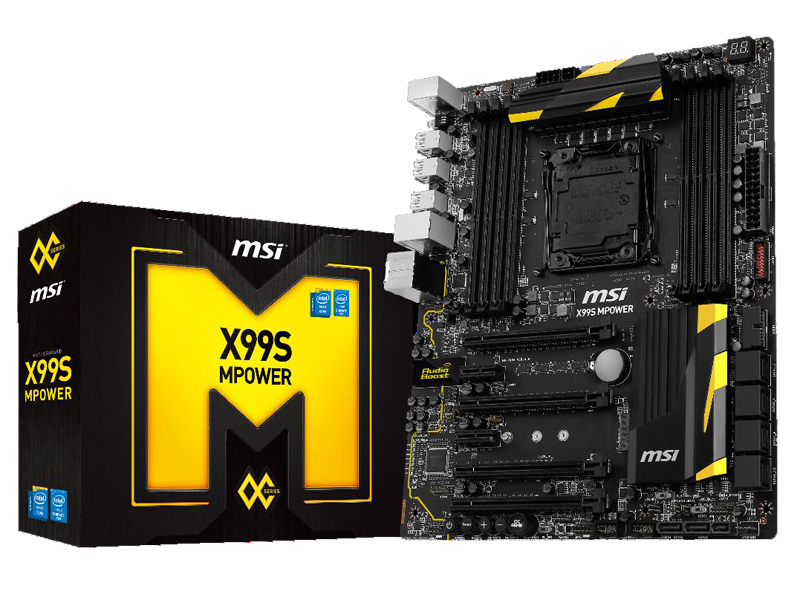 The MSI X99S MPOWER is another new board which we are looking at today which keeps the overclocking design cool and interesting. 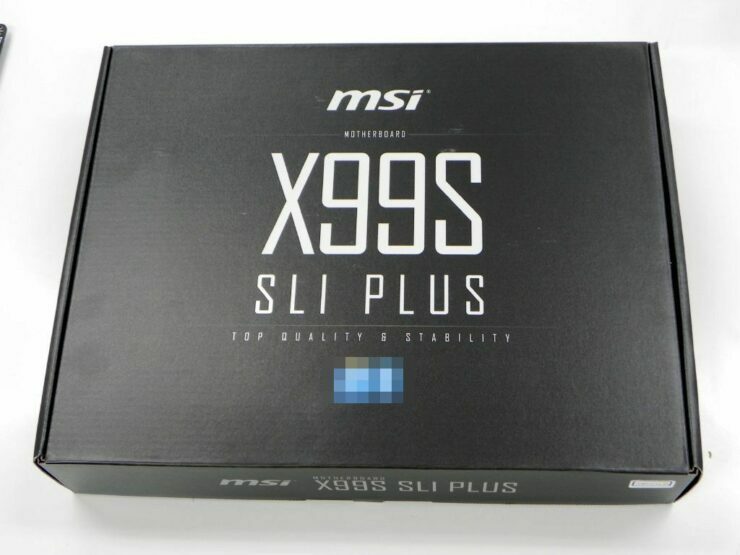 The MSI X99S MPOWER is one tier below the XPOWER although it remains to be seen if ther would be a X99S MPOWER MAX from MSI in the future. The MSI X99S MPOWER comes in the ATX form factor, is capable of supporting Intel’s latest Haswell-E processors and doesn’t break the $400 US barrier in terms of prices. 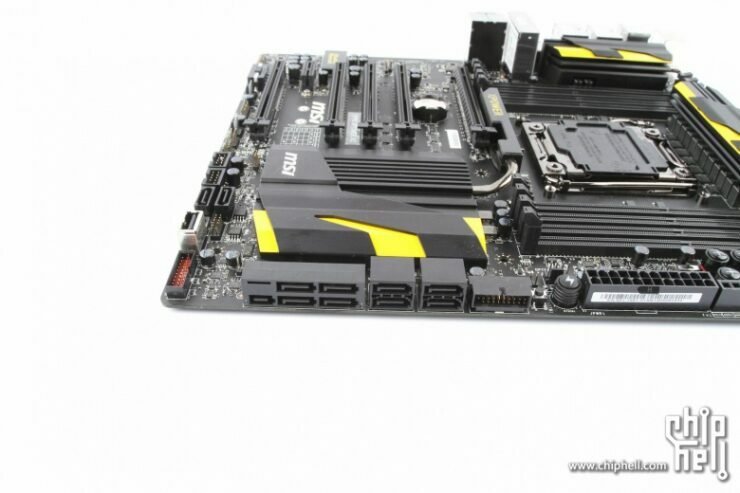 The motherboard adopts the yellow and black color scheme with two sets of heatsinks on the PCH and PWM area while power is pumped through a 8+4 Pin connector configuration. The Diagnostic LED can be spotted on the top right corner of the board. The MSI X99S MPOWER features the LGA 2011-3 socket and is powered by a 12 phase DIGITALL Power PWM design with all the Military Class IV goodies we detailed in the MSI X99S XPOWER’s specifications above. Other features include eight SATA 6 Gbps ports on the storage front including a single SATA Express port, a USB 3.0 header and two USB 2.0 headers. Expansion slots include four PCI-e 3.0 x16 and two PCI-e 3.0 x1 slots and 1 x mSATA connector. Audio Boost with ALC 1150 chipset can be spotted along its own isolated PCB indicated by a yellow line. We can also spot some switches such as OC Engine, BCLK + / – , Reset and Power On/Off buttons at the bottom of the board. I/O includes 8 USB 3.0, 2 USB 2.0, PS / 2, Gigabit LAN port and a 7.1 Channel HD audio jack. The X99S Gaming 7 is the standard gaming motherboard which doesn’t include the AC WiFi module or the streaming engine which is featured on the X99S Gaming 9 AC. These features have been removed to make the Gaming 7 a more price effective offering under the Gaming brand. 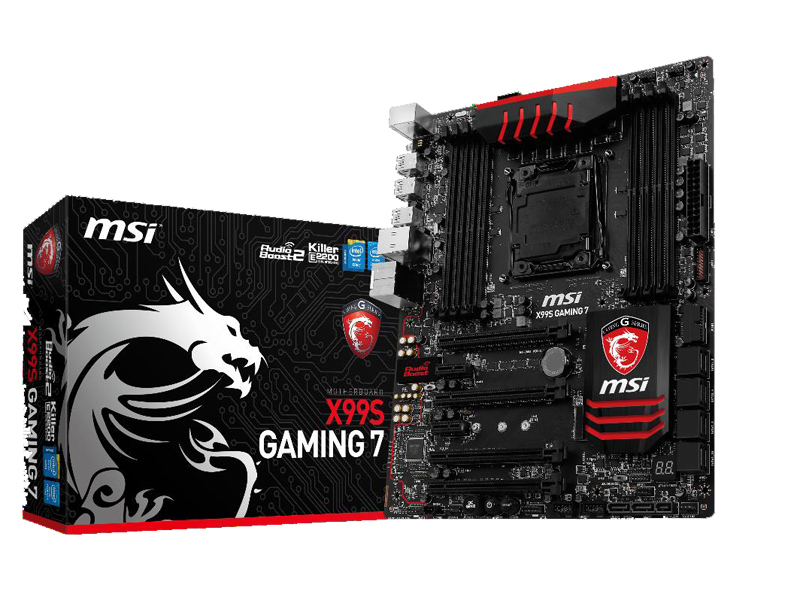 The MSI X99S Gaming 7 has been optimized for gamers to allow them to get all of the features of the X99 platform and MSI’s gaming brand under a lower price range. The motherboard leaves users with various options to expand and upgrade their PC configurations while staying around a lower price point as compared to a expensive board such as the XPOWER or the Gaming AC 9. The MSI X99S Gaming 7 features the LGA 2011-3 socket which will be able to support Intel’s next generation Haswell-E HEDT processors arriving on 29th August. The board features a 8 Phase PWM suplly powered by a 8-Pin EPS connector and a 24-Pin ATX connector that powers the board. The socket is surrounded by eight DDR4 DIMM slots (four at each side). The motherboard maintains the Military Class IV standard featuring high-quality electrical components including SFC (Super Ferrite Chokes). 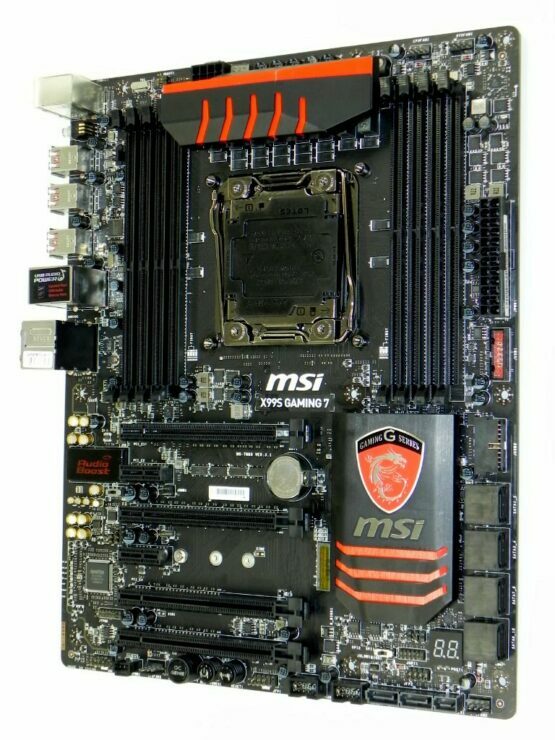 It has the same red and black color scheme along with the G-Series dragoon design scheme which MSI adopted since the Z77 era. The two heatsinks cover the PWM and the X99 PCH. Storage includes 8 SATA 6Gbps and a single SATA Express port followed by a two USB 3.0 headers and two USB 2.0 headers. A Diagnostic LED along with a BIOS switch and OC engine switches can be found at the bottom of the board. Expansion slots include four PCI-e 3.0 x16 and two PCI-e 3.0 x1 slots along with a mSATA connector. 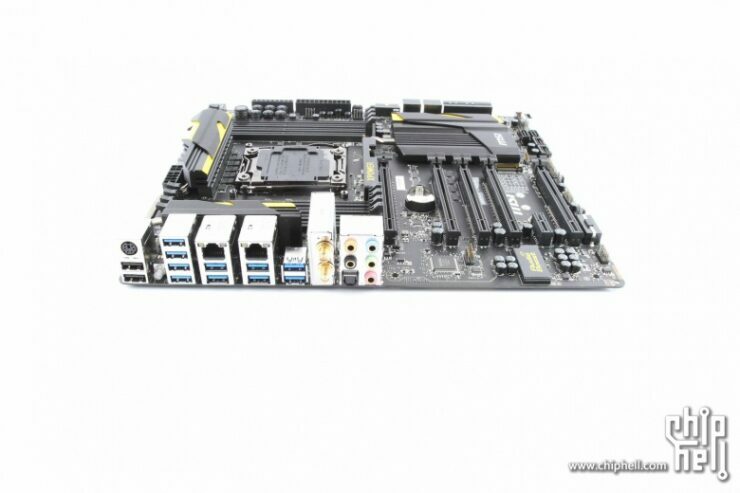 The board is optimized for 3-Way SLI and CorssFire support. A Audio Boost ALC 1150 codec powered chipset is located on the isolated PCB next to the expansion slots which powers the 7.1 channel audio jack at the I/O panel. The I/O panel also includes a Killer E2200 powered LAN port, 6 USB 3.0 ports, two USB 2.0 ports and a PS/2 port. MSI’s X99S SLI Plus is the standard and entry level model of the X99 motherboard lineup from MSI but its also one of the most beautiful motherboards I have seen. 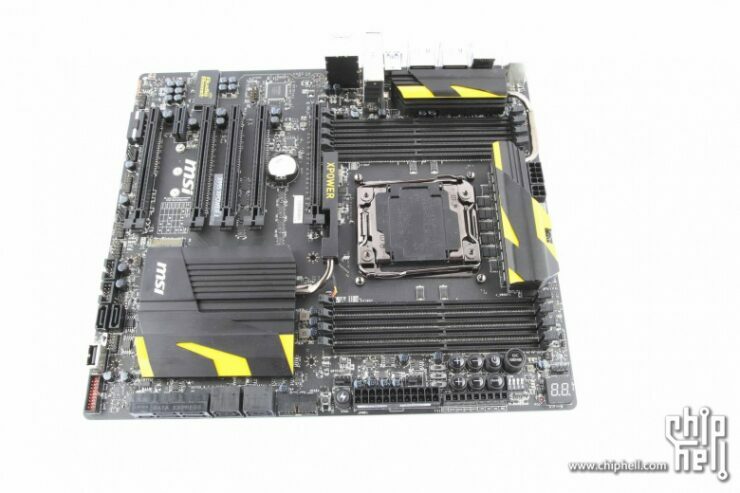 Many users have long awaited a full black motherboard after the ASUS X79 Rampage IV Black edition and EVGA’s X79 Dark. 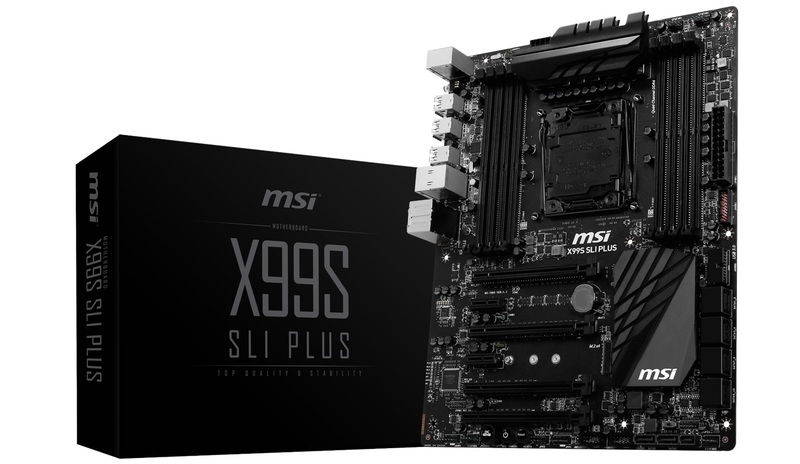 The X99S SLI Plus is the first full black motherboard of the X99 platform which comes at a low price range around $250 US. 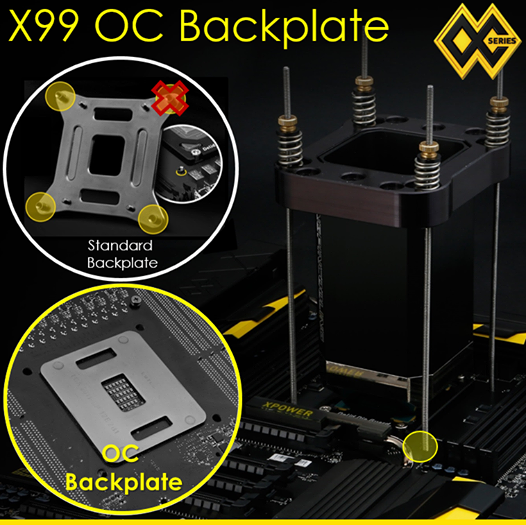 It still packs all the core elements that make X99 a platform for enthusiasts as detailed below. 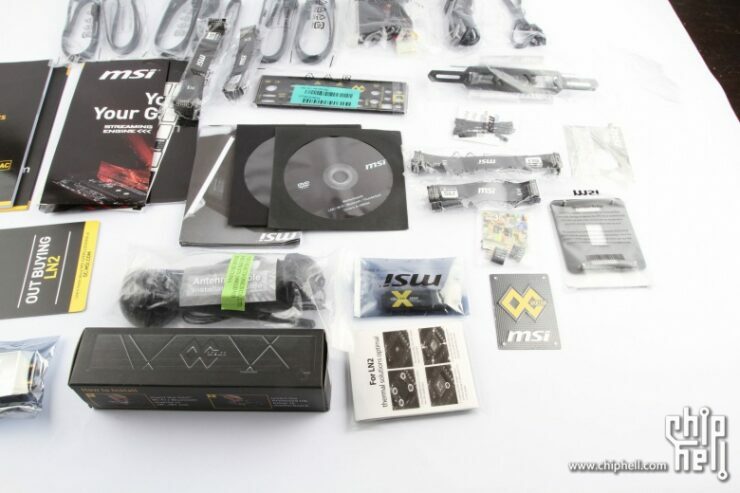 The MSI X99S SLI Plus motherboard comes with an 8 Phase PWM supply fitted with MSI’s Military Class IV components which include military grade capacitors and MOSFETs. The LGA 2011-3 CPU socket is surrounded by eight DDR4 DIMM slots which will be able to support overclocked memory up to 3000 MHz+. The motherboard has a beastly design that is incorporated in a ATX form factor. Both black colored heatsinks cover the VRM and X99 PCH featuring a distinct design scheme. Storage includes 10 SATA 6 GB/s ports and a single SATA Express port at the bottom left corner of the board. There’s a USB 3.0 right-angled header right next to the storage outputs. Power is provided through a single 8-Pin connector and the regular 24-Pin ATX power connector. Expansion slots include four PCI-e 3.0 x16 slots and two PCI-e 3.0 x1 slots for quad-way SLI and CrossFireX multi-GPU support. Since this is a targeted motherboard for SLI, it will be optimized for dual-GPU operation. Bottom of the slots, we can spot a OC Genie, Power On/Off and Reset switches. The I/O panel is bundled with many ports which include USB, PS/2, Gigabit LAN. 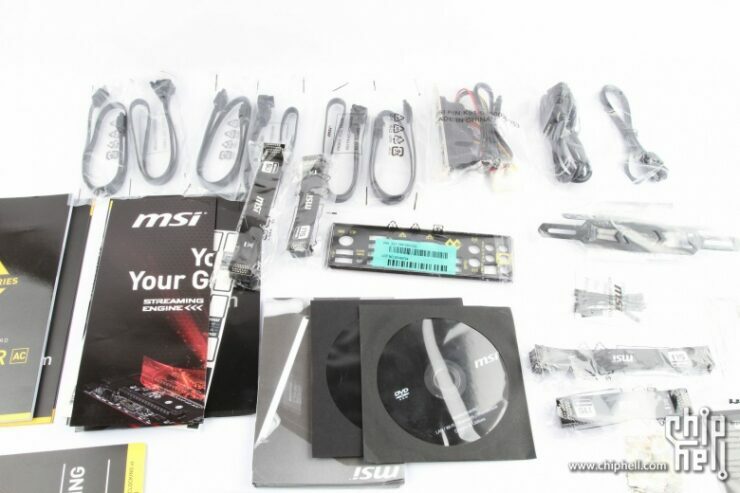 MSI has used an 8 Layer PCB which provides stability and more bruteness to the design itself.